This trip took a fair bit of putting together and was based around doing two days of the PTG Bulgaria Track Bash tour, when it was in Greece with OSE MLW’s. 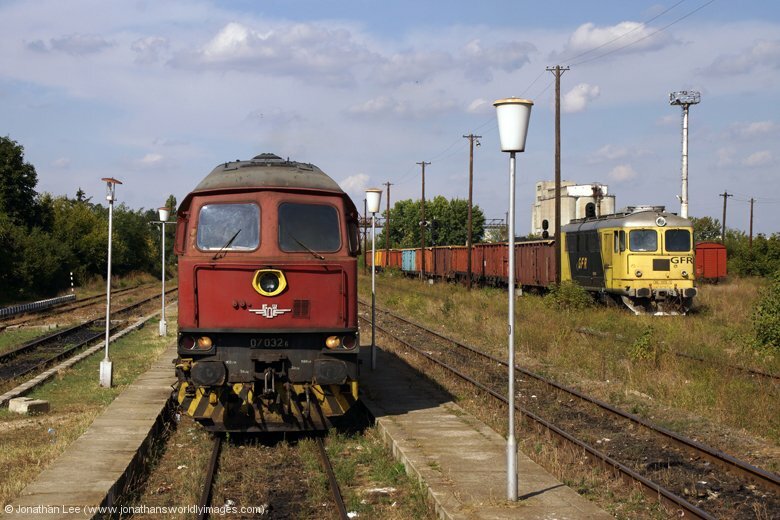 However when the dates for the PTG Bulgaria Track Bash tour were changed and the tour was ultimately turned into a Greek Track Bash tour the planning was turned upside down and we basically went back to starting from scratch. In the end a decent plan was hatched to start in Bulgaria, mainly due to it being the cheapest place to fly to, then head into Serbia, dash into Montenegro and back, and then into Macedonia before returning to Bulgaria to do the PTG Greek Tour. After the tour I’d head on from Bulgaria to finish in Romania. Originally we’d planned to head into Kosovo as well but as the trip now warranted more time in Greece something had to give. Having had literally no clue about the geography of Eastern Europe before starting this plan it was certainly an eye-opener but the hard work paid off and time spent at home planning the trip allowed for the rewards to be reaped when out doing the trip. Ibis Gara De Nord (Bucharest) – 143, Calea Grivitei Sector 1 Bucharest, Romania (€110.40 for a single room for three nights) – just down the road from Bucharest Nord, out of the left hand side of the station (as you walk towards the buffer stops from the trains), down the steps, over the small square and it’s about 100m up the road on the right; I have to say I was surprised at the size of the place, and how grand it looked. The first room I was given had a constant noise from the AC units so I was moved, when I asked, to another room which had two large double beds. This room was quiet, had all the Ibis mod-cons and the WiFi was free throughout the hotel. Food in the hotel’s restaurant was cheap, fresh and very good. I’d been told by others that Romania had been the worst country in Europe that they’d ever visited so as I sat in my compartment, with virtually the whole train to myself, on board the 0920 Varna – Ruse you can imagine just how much I was looking forward to getting into Romania, especially as I was on my own. Still I had the previous week to reminisce about during the four hour journey to Ruse as I’d planned to try and catch up on a lot of bureaucracy during me alone time; of course it would have actually helped if I’d charged my laptop since I’d last used it, and almost flattened it, in Macedonia some 10 days previous; what a schoolboy error! I had to reacquaint myself with the art of writing things down on paper; thankfully I had some scrap paper with me. The train never filled at all to Ruse and I had the run of the front coach all the way. The scenery is nothing like that on the journey from Sofia to Levski either and was rather dull really. Thankfully I had something to keep me occupied. The first thing of interest that caught my eye was 87017 in the yard at Ruse which surprisingly still had its Iron Duke nameplates attached! Ruse station is rather grand for the amount of trains it has passing through it nowadays and I’m sure it had seen a lot better days. Some of the tucked away corners outside it had the remnants of fires where the homeless looked to have taken refuge at some point and other parts were boarded up. It was a shame really as the architecture and the building itself were actually quite nice. There are quite a few places to get snacks outside and over the road so getting a bite to eat wasn’t a problem. Back on the station there weren’t many folk about and those that were all disappeared on EMU 32083/084 working 40115 1400 Ruse Razpredelitelna – Gorna Oryahovista, leaving only a few waiting for IC460 0755 Sofia – Bucharest Nord; and even when that did arrive some were only waiting to greet people from it. 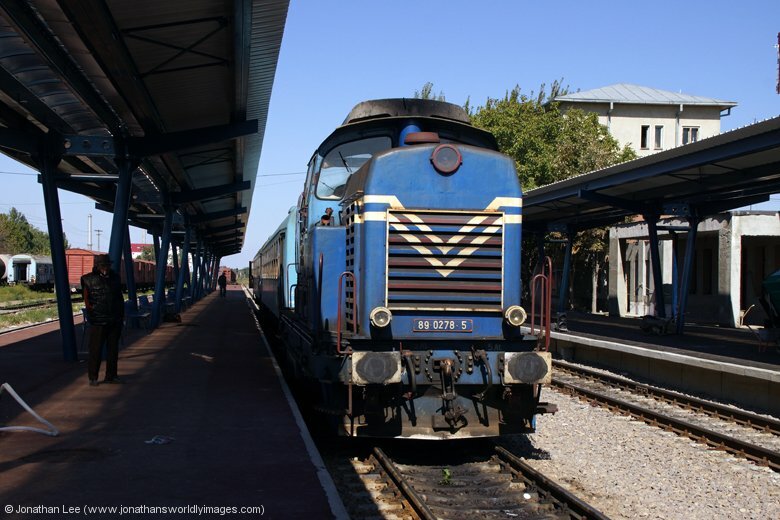 The loco to work the train over the border, 07032, had arrived into the station well before IC460 did itself and when 45158 arrived with IC460, clearly having gone Sofia – Varna on 2615 1300 Sofia – Varna then Varna – Sofia on 2616 2145 Varna – Sofia the previous day and then straight onto IC460 at Sofia, it immediately shunted the front coaches off the train and into the opposite platform leaving one BDZ and one CFR coach to go through to Bucharest. The reservation I’d made at Varna the previous day, costing 1.44 Lev, had clearly been a waste of time as there were only about a dozen people on the train at Ruse. My reservation had been in the BDZ coach and the CFR coach was completely empty. Before departure the Bulgarian border police came through the train and checked passports, in the meantime 07032 was attached to the front, ready for the off, and we were away right time, with yet another crap 07 on the front. 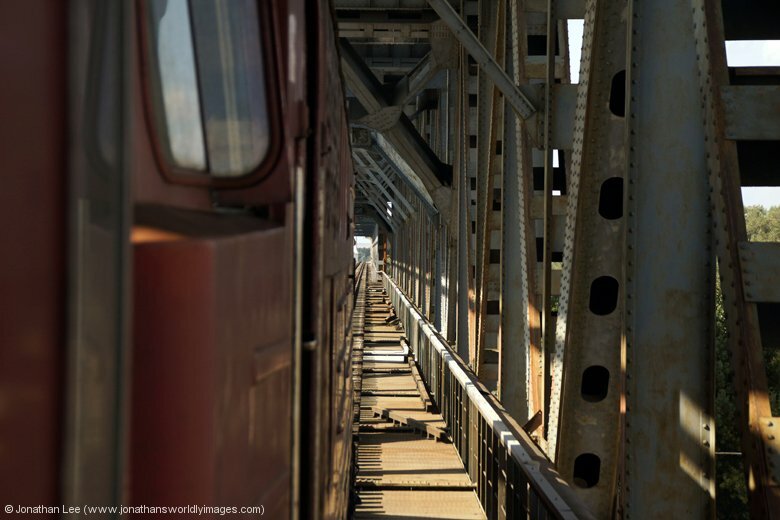 This one really did clag lots, while making no noise, when it was opened up; except for when I attempted to video it coming off the bridge on the Romanian side. 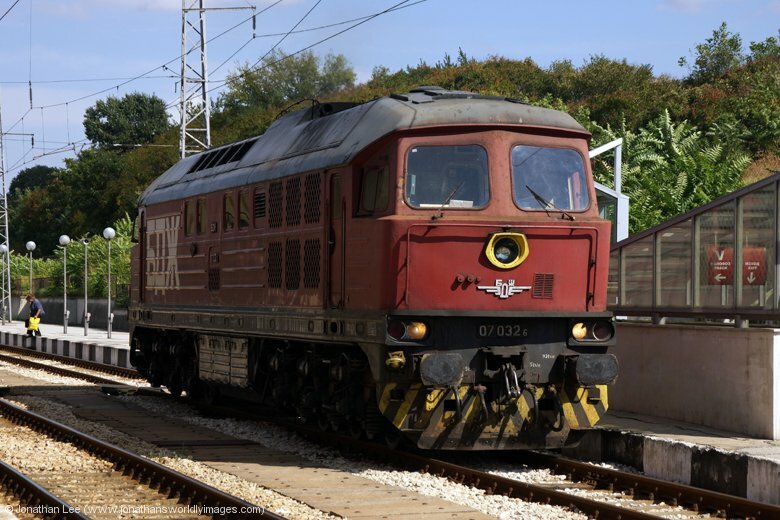 I can’t believe I’m actually saying this but after the last few days in Bulgaria I was actually glad of an engine on a train that actually made a little bit of noise; when CFR GM 65-1204 dropped onto the train. 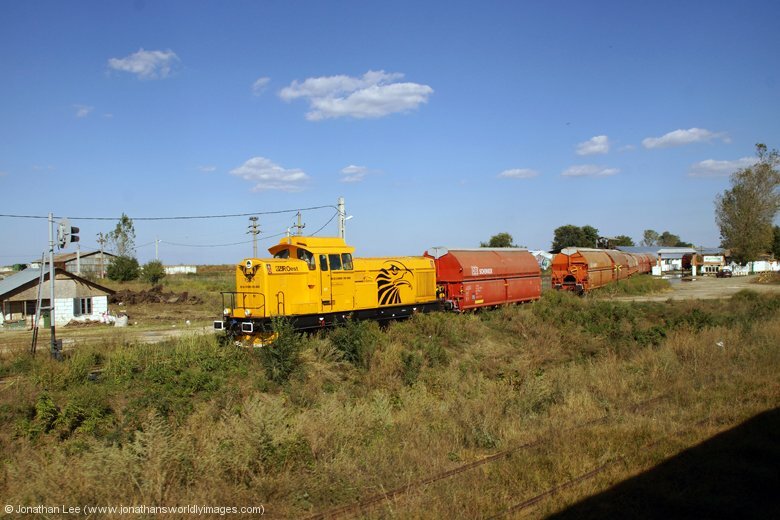 IC460 and the opposing working of IC461 from Bucharest are both timed to meet at Giurgiu Nord on the Romanian side of the border. The CFR GM ex IC461 shunts to IC460 and the BDZ 07 from IC460 shunts to IC461; both returning to whence they came from. 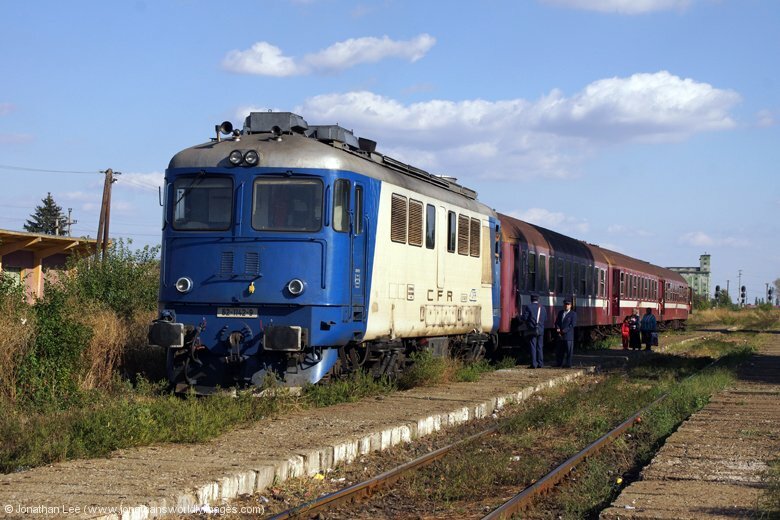 While the locos do their thing the Romanian border police do theirs and go through both trains checking passports. 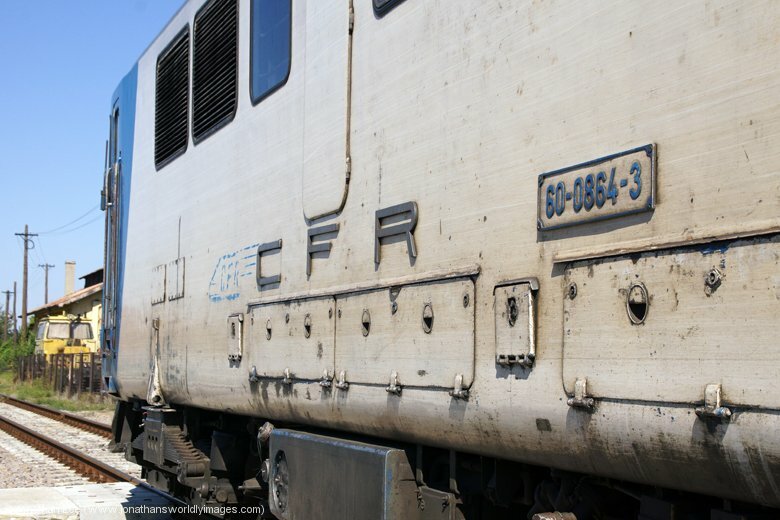 With only a dozen or so people on our Bucharest bound train we managed to be 10 late away, the loco swap seeming to take a lot longer than it needed to and being the main cause of the delay but had the train been full I’m sure there would have been further delay. Still, after the stop at Videle, where the train loaded up with locals, we hammered along to arrive into Bucharest Nord bang on time and the first thing I found on the blocks when scanning about was CFR Sulzer 60-1356 which had arrived shortly before me with R7040 1455 Urziceni – Bucharest; this being a turn that used to be an 82 before the Summer yet seems to have stayed in the hands of 60’s/62’s since the Summer timetable had finished a couple of weeks before. 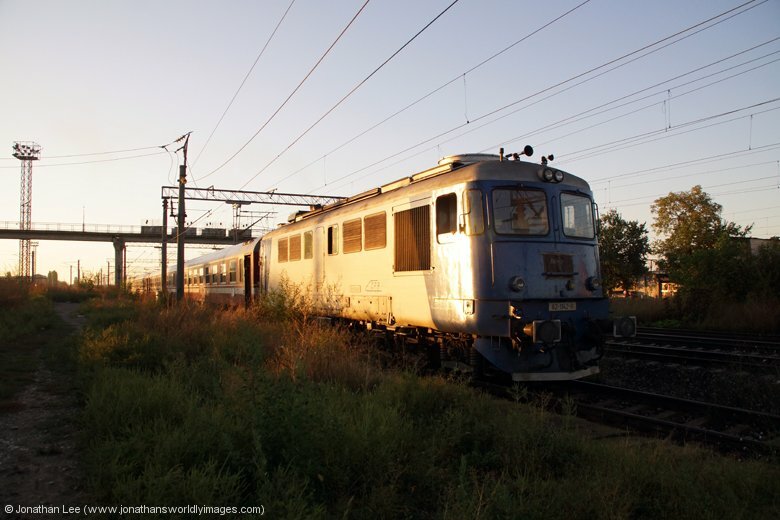 In the evening, after 1700, there are no moves that I could find to do diesel hauled trains so during my lengthy journey from Varna I’d managed to figure out a better move than I’d originally had planned, which involved an earlier finish in Bucharest as well, so I went about doing my electric bash for the evening. Having no clue of how things work, how prompt trains generally run or even where places are and what they look like, just adds to the adventure in some respects, however once it starts getting dark things take a whole new turn when trying to figure out where you are! I was quite surprised at what Bucharest Nord has to offer by way of eateries, it’s a place you certainly won’t starve at, with the likes of KFC and McDonalds about! 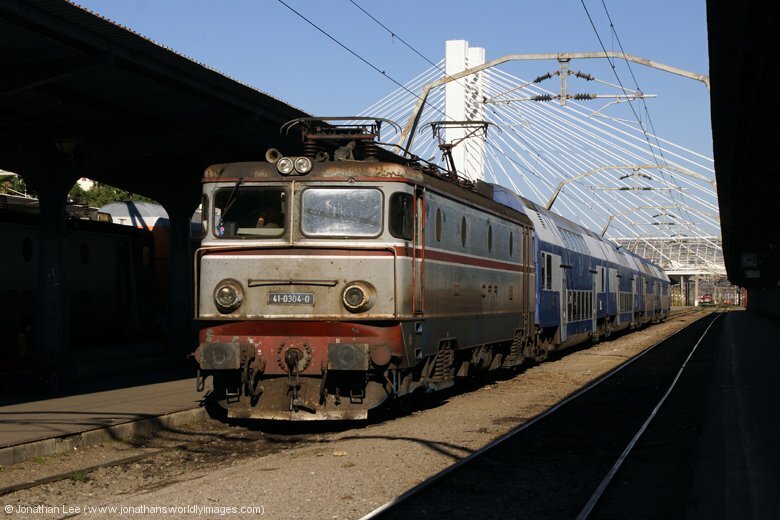 By the time I’d walked the length of the buffer stops to join EN472 1730 Bucharest Nord – Budapest Keleti I had a bit more of a clue what the lay of the land was and as CFR’s 477268 eased, and I mean eased, out of Bucharest Nord I was able to assess Bucharest Basarab, on the left hand side as we departed; which is nothing more than a few bay platforms chucked out in the sticks to seemingly connect with buses and trams, which are right outside the entrance. I later found a travelator that leads from the end of platform 1 to the metro station outside Basarab’s entrance, a short walk round this gets you through the doors to the platforms; allowing 10 minutes for tight connections is sensible! The journey to Ploiesti Vest was harmless, even if I did stand in the front vestibule throughout. 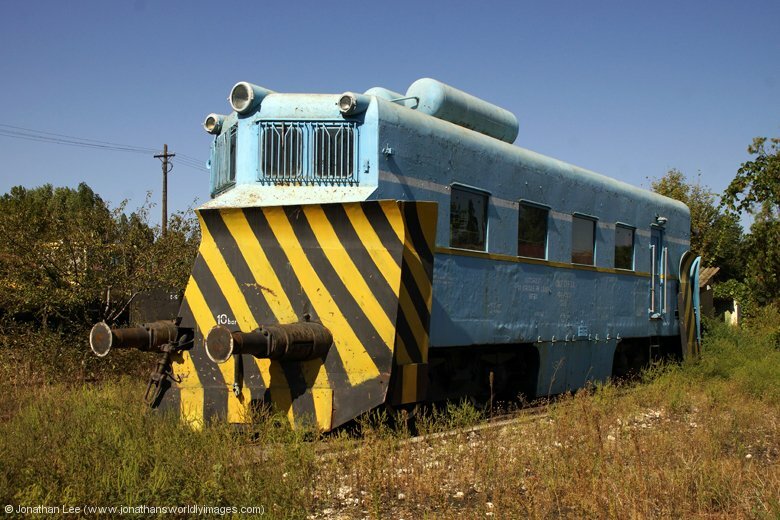 I thought there might be something said about the fact I didn’t have a reservation for the train but the gripper wasn’t remotely interested and just gripped my Balkan Pass. Ploiesti Vest had departure screens and they seemed to be displaying everything correctly and my train, one of the few a day that actually does Ploiesti Vest to Sud, IR1731 1640 Brasov – Galati arrived early but was held waiting the late running IR1746 0340 Saru Mare – Bucharest to depart first. 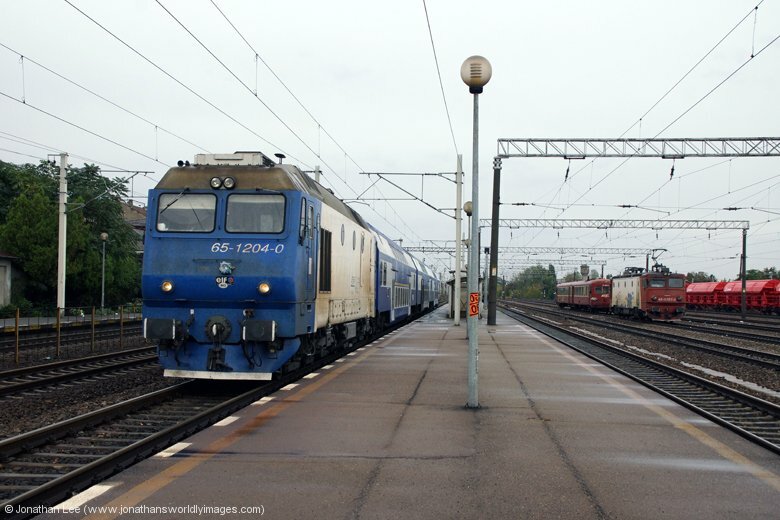 All trains towards Bucharest from Ploiesti Sud seemed to be a little late heading in, which put a move in jeopardy as a result and IR1752 1230 Suceava – Bucharest Nord did in fact miss R3007 1808 Bucharest Basarab – Brasvo at Crivina. 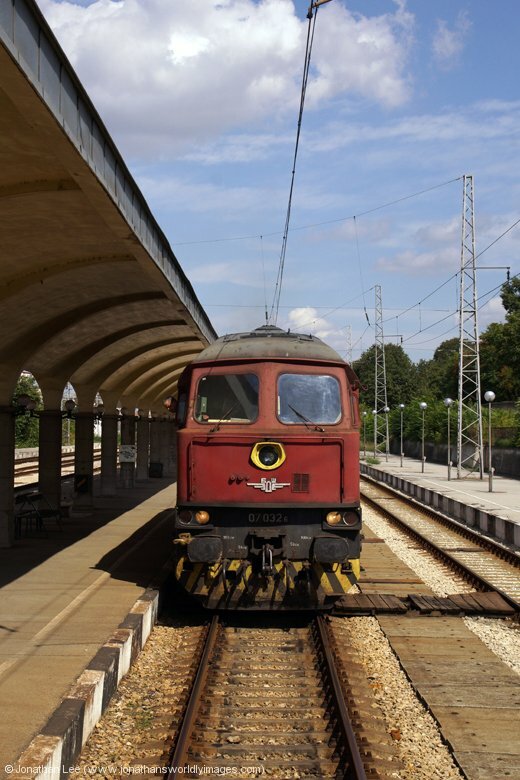 In the end it had seemed like it had been a good job as the train I’d been planning to return from Prahova Halt on, R3008 Brasov – Bucharest Nord had been retimed according to the EU Rail App and I’d have ended up sitting at Prahova and watching IR1556 1925 Ploiesti Sud – Bucharest Nord trundling through. 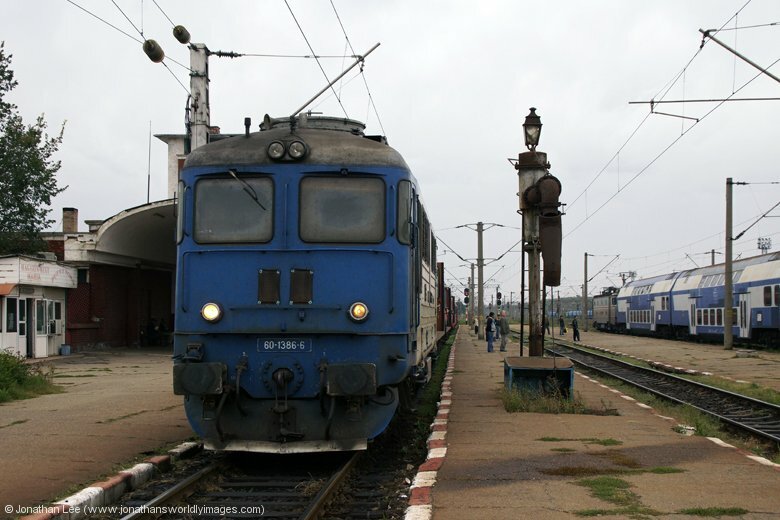 As it happened I ended up on IR1556 from Crivina and was content on doing it to Buftea for IR1622 0820 Timisoara Nord – Bucharest Nord behind but when IR1556 stopped out of course at Peris an opportunity arose; and I eventually took it! 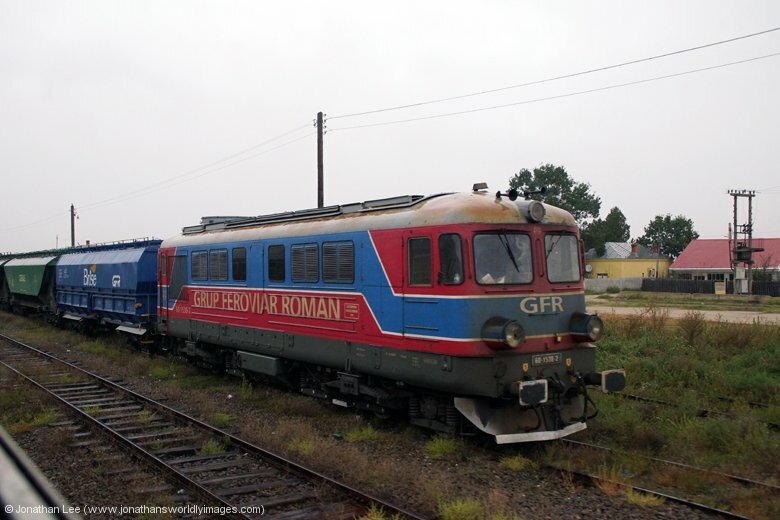 I was already looking at the EU Rail App as we came to a stand, for trains ex Buftea to Bucharest, and it was only after we’d been at Peris a couple of minutes that I noticed that the retimed R3008 was timed to arrive Buftea before IR1622 to then allow the express to overtake it. As the doors on CFR trains always seem to be opened regardless of where a train stops, there was no problem getting off and watching IR1556 depart shortly afterwards; then funnily enough 40-0482 arriving behind it with R3008. 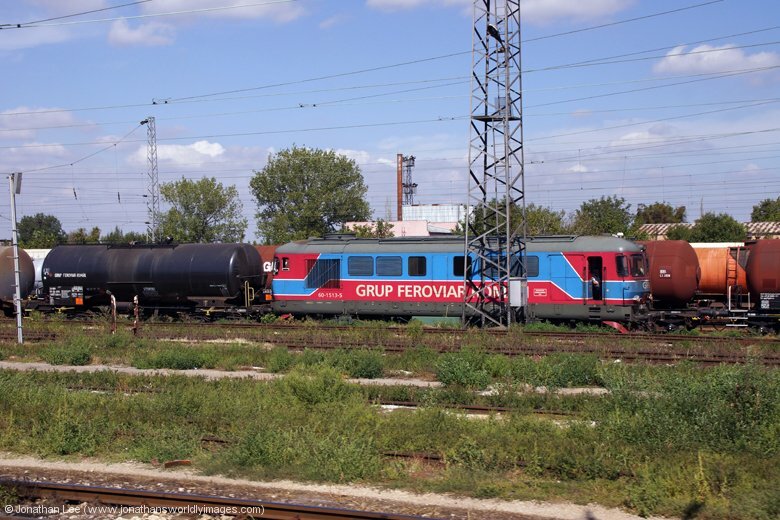 At Buftea it ran into the loop platform, I got off and could already see the headlights of IR1622 behind in the distance. 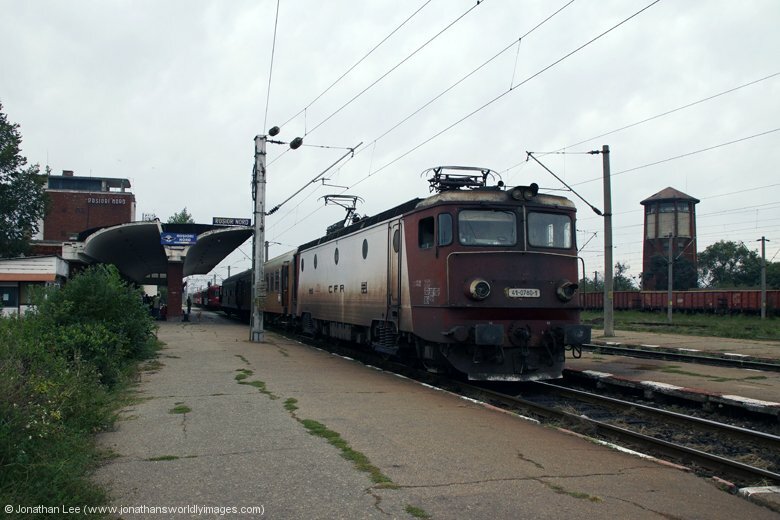 In it rolled with 477784, I got on; it departed and dropped me into Bucharest Nord at 2040 as it should have done. It was all very efficient and I was quite surprised at how well the little evening bash had gone, despite the few trains being a little late and the re-timing that I only found by chance. My hotel of choice was the Ibis just down the road from Bucharest Nord, out of the left hand side of the station (as you walk towards the buffer stops from the trains), down the steps, over the small square and it’s about 100m up the road on the right; I have to say I was surprised at the size of the place, and how grand it looked. There was a definite contrast from the street leading to it, with a large amount of homeless dossing on the pavements, in the parks and generally making the place look a lot worse than it probably actually was. It had been a long day and I was glad to take refuge behind the hotel’s doors for the evening. The first room I was given had a constant noise from the AC units so I was moved, when I asked, to another room which had two large double beds. This room was quiet, had all the Ibis mod-cons and the WiFi was free throughout the hotel. Food in the hotel’s restaurant was cheap, fresh and very good; loads better than the Ibis at Heathrow for example. Staying in one place for three nights was a refreshing change from all the traveling about and very welcome towards the end of a lengthy trip. A simple bash on this day, as handed to me by someone in the know prior to my trip. It was a cold morning as well and the first day in weeks that I’d had to wear long trousers. Breakfast was sought at McDonalds at Bucharest Nord station and I have to say it wasn’t the most straightforward of affairs at all, the meal deals being specific to certain items and certain drinks not being included and it all just got a bit hard in the end; despite the staff speaking English. 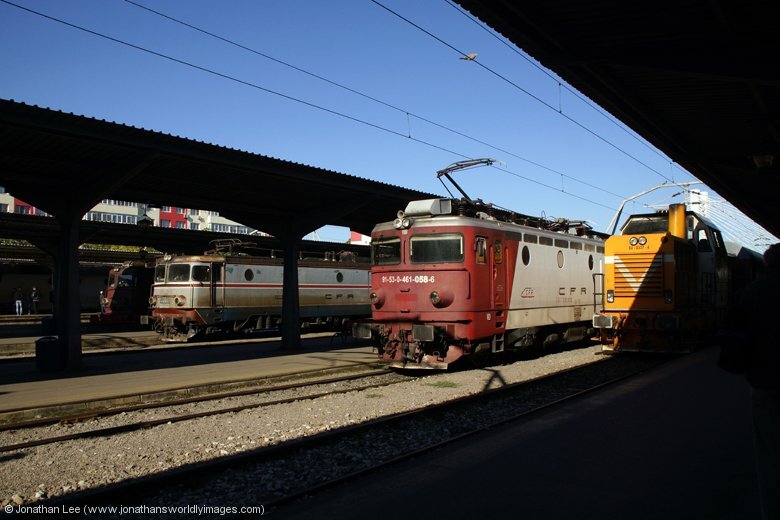 Having found Sulzer 60-1356 at the head of R7033 0725 Bucharest Nord – Urziceni I headed for my train and the warmth on board IR1593 0745 Bucharest Nord – Rosiori Nord was very welcome as 41-0920 whisked me to the train’s destination; the plan for the day being to cover the three Sulzer turns on the Alexandria branch. It seemed to be colder at Rosiori Nord, where upon arrival I found Sulzer 60-1386 just shunting off a set of stock in the platform; it had clearly just arrived dit on R9303 0715 Bucharest Nord – Rosiori Nord as per diagram and 42-0302 was just running round to work R9308 1015 Rosiori Nord – Bucharest Nord with the same stock. The wind at Rosiori made it quite chilly and if you’re only prepared for summer weather the shelter that the waiting room provided was quite enticing! I expected 60-1386 to come rumbling into the station with a set of stock from the sidings somewhere but when this didn’t happen I began to get a little concerned as the loco just sat in the sidings just south of the station, still running mind. 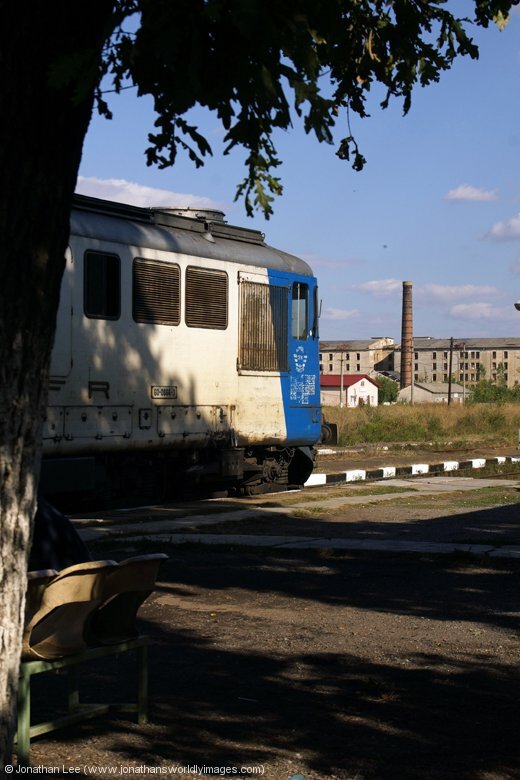 It wasn’t until 41-0780 arrived with R9384 0755 Craiova – Rosiori Nord and the destination boards were turned over on the side of the train, that my mind was settled. The boards revealed Alexandria as the destination and as soon as the electric had shunted off 60-1386 pottered out of the sidings and was bolted to the train. By that time the heavens had opened at it had began raining, just to make it a little more miserable than it was. The stock wasn’t in the best of condition but at least had opening windows, and under the circumstances thankfully they closed fully as well. 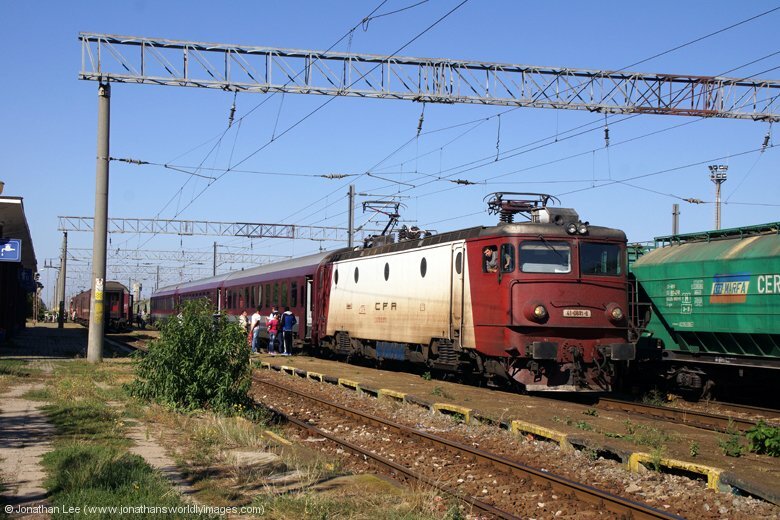 We departed, after 41-0809 arrived with the tight plus while working R9305 0815 Bucharest Basarab – Rosiori Nord, and pottered off down the Alexandria line. As expected 60-1386 wasn’t up to much at all and all I achieved while trying to give it the benefit of the doubt was getting wet. The journey then became about trying to keep warm and keep the school kids, that the train is clearly run for, out of the compo and annoying themselves rather than others. En-route the rain really did start coming down and by the time we rolled into Alexandria it was absolutely hammering it down; it just couldn’t get any more miserable. 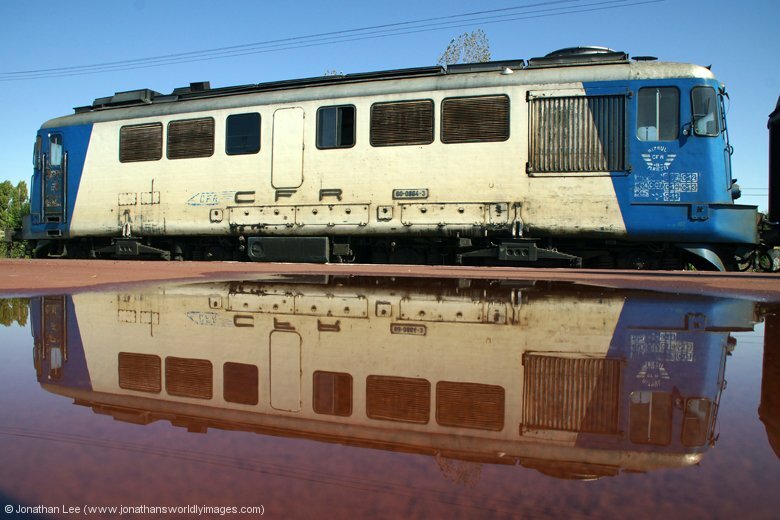 I wasn’t going to let the rain beat me and geared myself up to running down the platform to get some photos of 60-0748/62-1149 that were already attached to the stock to work R9364 1220 Alexandria – Rosiori Nord. The light was crap, my camera ended up soaked and I spent the return journey to Rosiori Nord trying to dry off in a compo on a wedged train. Thankfully the other normals on the train opted to sit in my compo, again leaving the college kids to their own devices as they run riot through the train. As we departed Alexandria I wasn’t looking forward to the second trip down the branch, to get 62-1149 in, at all. The rain was relentless and the cold becoming uncomfortable. I don’t know why but at Rosiori, the shack before Rosiori Nord, I decided to walk into the open coach at the front of the train and at least attempt to find out what 60-0748 sounded like. I was pleasantly surprised by what I found, not by the thrash as it amounted to nothing, but the fact that both locos were powering. 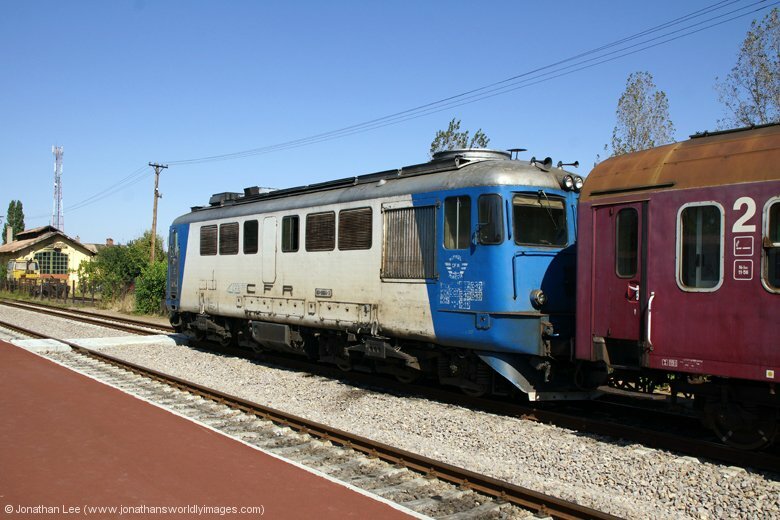 Initially I thought that on the 62 on the inside was doing the work but no, both locos were powering and the driver in the 62 seemed to be doing more than the lead driver on the 60. What that little bonus discovery did was save me from having to blunder my way back down the branch in the rain and cold on freezing stock with poor engines and loads of kids. The relative warmth of IR1824 0710 Deva – Bucharest Nord almost thawed me out en-route back to the capital and allowed both my jacket and camera to dry in the process. The rains had stopped by the time I arrived into Bucharest but it was still cool. As I had no real plan, other than the electric move I’d done the previous evening, I’d managed to cobble together a ned plan on the train to get some GM’s in before doing the electric move again. 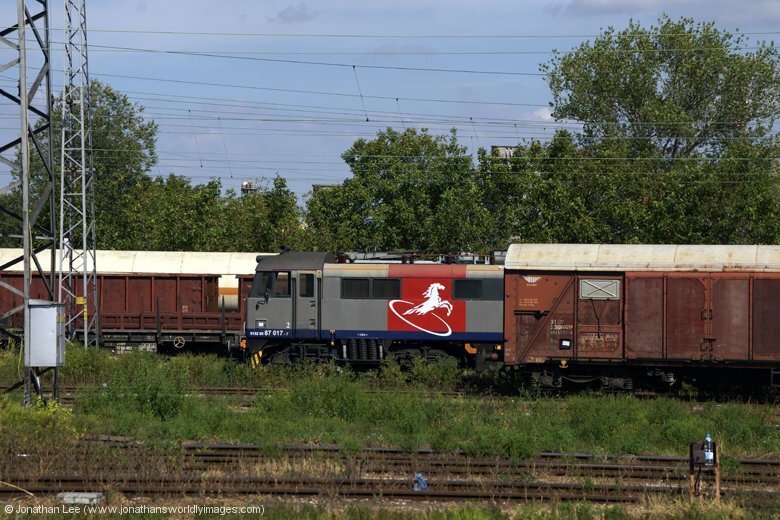 Best laid plans soon went in the bin though when I realised, while stood at Basarab contemplating doing 65-1349 out on R9025 1605 Bucharest Basarab – Pitesti, that I could spin out to Carpati Halt and cover the inbound R7040 1455 Urziceni – Bucharest Nord; which would hopefully be 60-1356 returning off R7033 that morning. 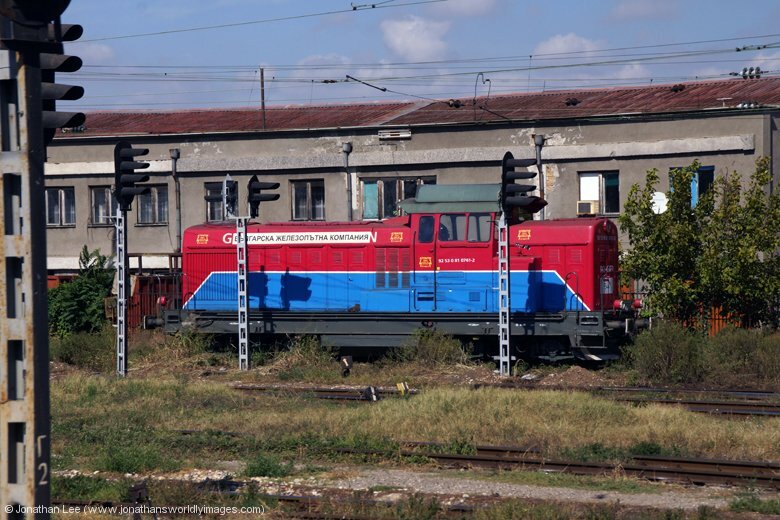 I managed to watch the GM leave at 1605 and did 40-0392 to Carpati Halt instead, behind it on R9309 1615 Bucharest Basarab – Rosiori Nord, before I actually realised that the GM stopped there as well! This almost cost me the move as the blue & white of the approaching Sulzer was soon into Carpati, only a few minutes after I arrived. 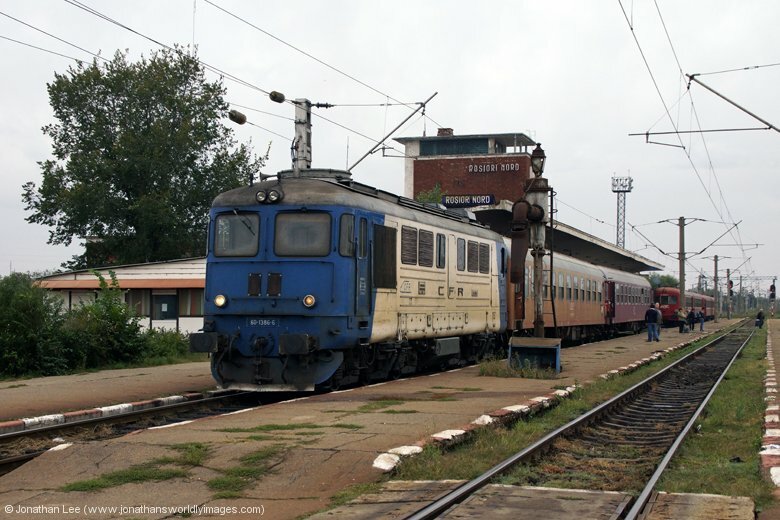 It wasn’t 60-1356 but 62-1142 instead; my mind at that point figuring out that it was quite likely that the turn was out and back from Urziceni with the northbound loco then running to Ploiesti Sud in the afternoon and the inbound loco coming off the morning Ploiesti Sud – Urziceni. 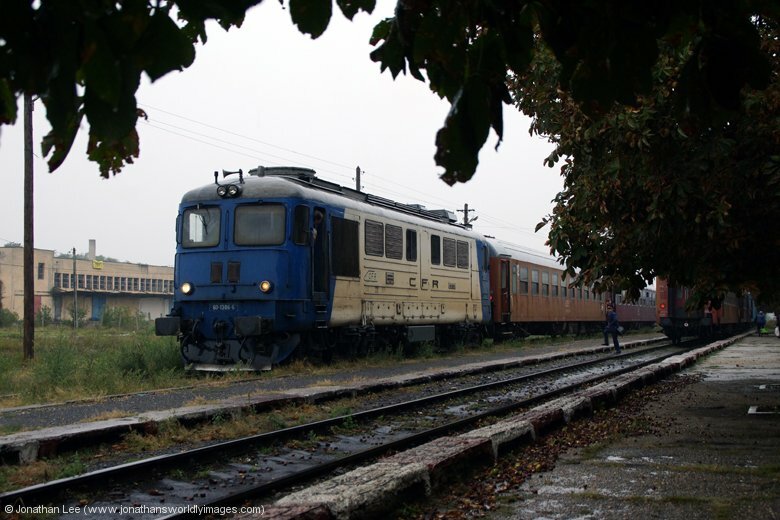 I wouldn’t say the afternoon brightened up but the fact the rain had stopped gave that impression and after a quick walk down the travelator to Basarab, for the second time that afternoon I was Chitila bound on GM 65-1204 working R9105 1655 Bucharest Basasab – Targoviste. 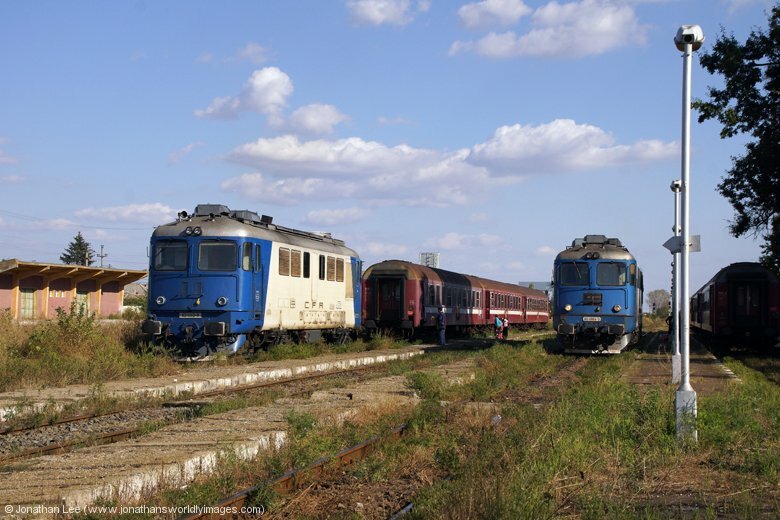 From there a quick spin to Darza with 40-0734 working R5007 1715 Bucharest Nord – Buzau for 41-0160 back to Buftea working R3006 1430 Brasov – Bucharest Nord; where similar move followed to that of the previous night this time with 45-0321 working IR1553 1745 Bucharest Nord – Ploiesti Sud to its destination for an on time IR1752 1230 Suceava – Bucharest Nord with the same loco as the previous night, 41-0588, to Crivina where it made R3007 1808 Bucharest Basarab – Brasov; unlike the previous night. 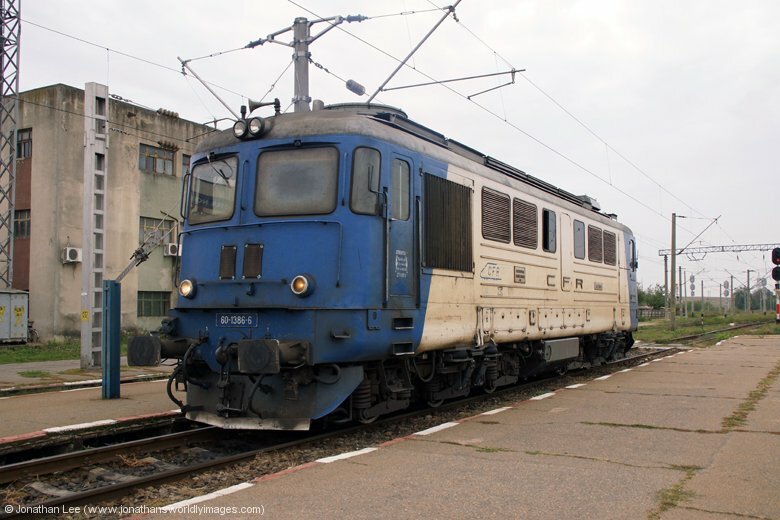 With opposing working R3008 being retimed slightly later this allowed for a move to Brazi for 40-0402 back to Buftea on R3008 where, as per the previous night, I stepped off, walked up the platform a little and boarded IR1622 0820 Timisoara Nord – Bucharest Nord, which was already visible in the distance and rolled in with 477784, as it had the previous night. The guard on R3008 had asked where I was going as I got off and looked a little confused when I told him Bucharest and boarded IR1622; the confusion seemingly as I seemed to know what I was doing! I was glad to be back at the hotel that night but not glad to be told that there was no room at the Inn as regards the restaurant. It was completely empty yet I wasn’t allowed to eat in it as a group was arriving shortly after me. A quick chat at reception soon rectified the situation and I waited in the bar until my food was cooked to then take it to my room; simples, or not as the case was. And having walked 6 flights of stairs with a tray I went back down to reception in the lift with my food as the damn room card wouldn’t open the door. The receptionist told me it was as I had two separate bookings for the hotel and the first had run out, canceling the card automatically; it wasn’t helpful when she joked that it didn’t seem to be my night! The food wasn’t as good as the previous night either, probably as it had been rushed? Still, I was grateful of it and didn’t waste any time that night when it came to getting to bed; the day had been hard work, no thanks to the atrocious weather. My second full day in Bucharest and I was again following a suggestion made to me before I’d left the UK, a nice circular trip; Bucharest – Ciulnita – Slobozia Veche – Urziceni – Ploiesti Sud – Bucharest. It was obviously centered around Sulzers and was quite a good move on paper, with a bit of down time in the afternoon at Slobozia. I didn’t need to be Ciulnita bound until the 1015 Bucharest – Constanta so decided on a few spin moves before heading off to do the bash. McDonalds was a lot more straightforward now I understood how things worked in that particular outlet and I was walking down the platform to await the loco backing onto R7033 0725 Bucharest Nord – Urziceni, with plenty of time to spare. 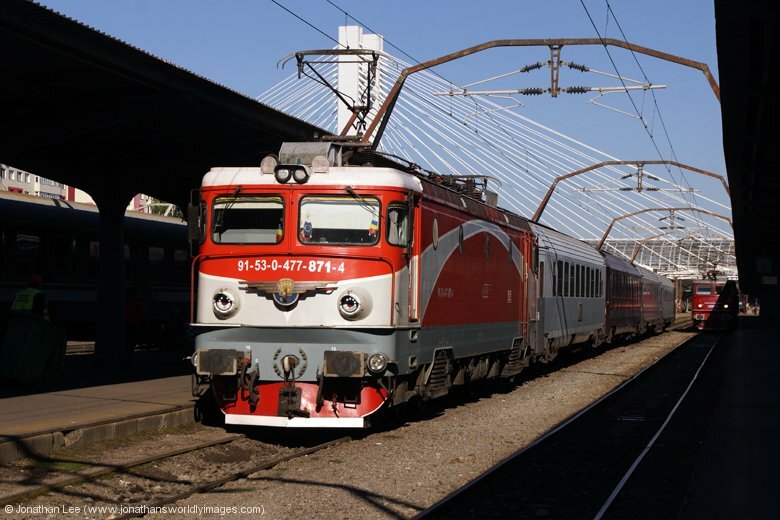 Unfortunately it was 62-1142, the same one I’d had the previous evening on R7040 1455 Urziceni – Bucharest. As it didn’t back on until 0720 it prevented me from doing a different train out to Carpati Halt so I did the Sulzer anyway. It was still dark and on this occasion, my second visit to Carpati Halt, I had more time to figure the place out as it was a little confusing, especially if you didn’t have a clue about the geography like me. The platforms are made of concrete blocks and surrounded by tall grass; locals use them to get from one side of the railway to the other, despite there being a footbridge that goes over to adjacent carriage sidings. The destination of the train decides which platform a train uses at Carpati and it seems there are four directions you can head from there, which aren’t accessible from all platforms. 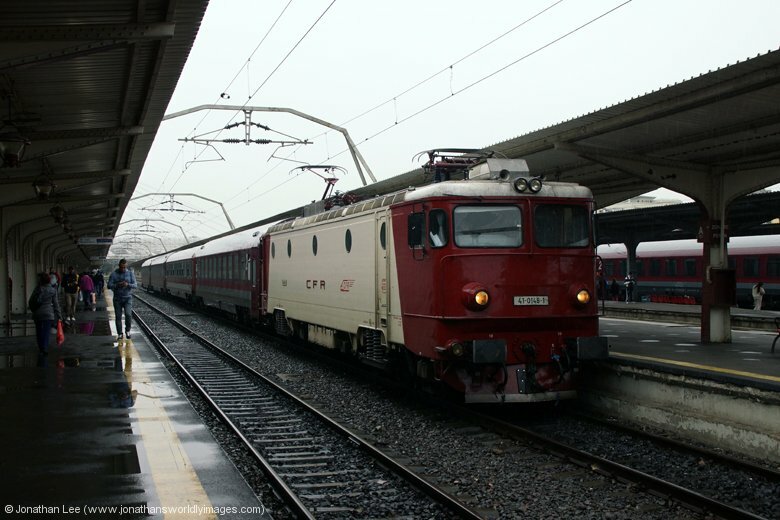 Only one person boarded R7033 at Carpati but there were a few waiting on the opposite platform, across the main running lines, so I assumed that would be where R5021 0736 Bucharest Basarab – Ploiesti Sud would depart from and joined everyone else in waiting on that platform. By 0800 nothing had shown up, a few trains had run straight through on various lines, but nothing had stopped at all. My concern being that if something didn’t turn up soon I was probably going to have to start walking as there was nothing stopping going inbound for hours so I had to do a train outbound to get back in regardless; or use my feet of course; it is 3.6km into Bucharest Nord from Carpati and my train out of Nord was at 1015. Just when I’d began to seriously consider the walking option and was stood on the footbridge seeing if there was any sign of life in any direction, in rolled 41-0587. 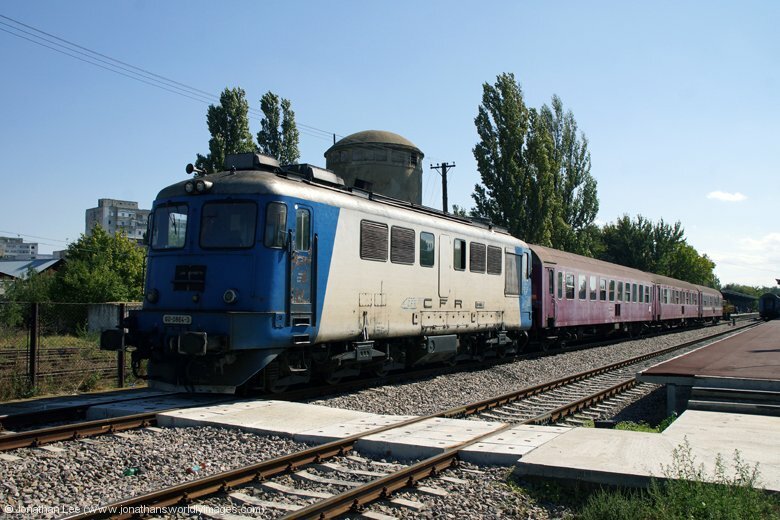 It was smack in the path of R9023 0806 Bucharest Basarab – Pitesti but the normals soon confirmed it was indeed R5021 to Ploiesti; of course the Ploiesti is booked electric and the Pitesti diesel so there was only one answer as to which train it was. 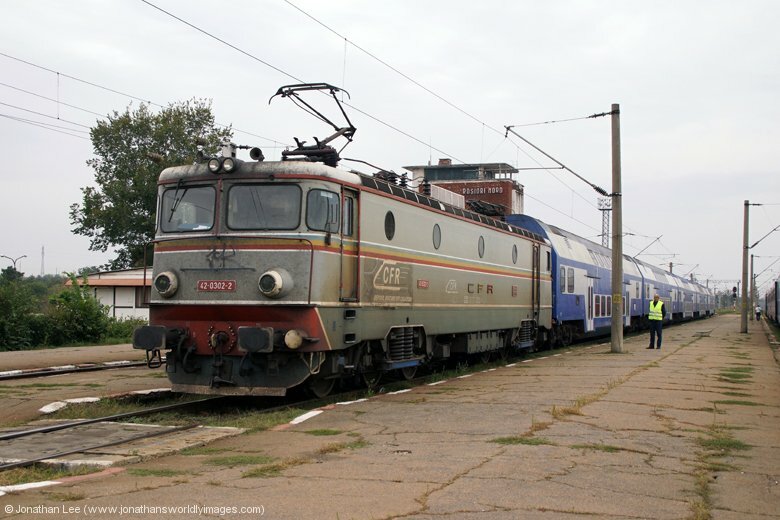 I’d seen R5021 in Basarab when I’d departed with 62-1142, the name boards on the side hadn’t been turned round at that point though so I hadn’t actually realised at that point which train it was; nonetheless 41-0587 had already been bolted to the front for departure. Decisions, decisions, did I or didn’t I get off at Pajura for R9023 behind to Chitila? 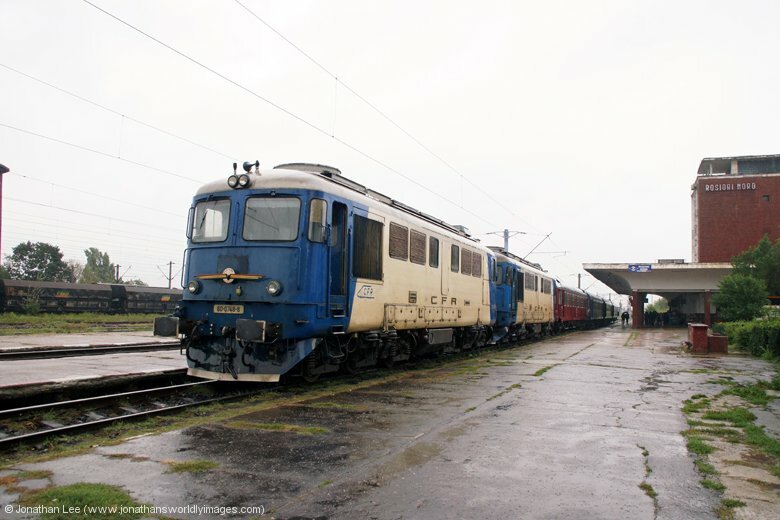 Yes was the answer and 65-1349 was following very closely behind with R9023 and had only just set off from Chitila when 65-0915 arrived with R9104 0525 Targoviste – Bucharest Basarab. 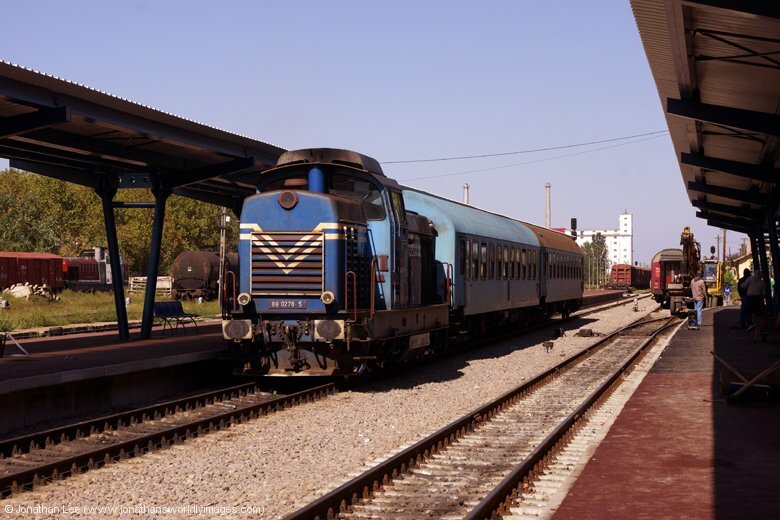 I couldn’t resist the step back for R9024 0628 Pitesti – Bucharest behind and was quite confident nothing would go wrong as I had over an hour back in Bucharest before the 1015 Constanta departed. 63-1060 was about 15 late with R9024 but it wasn’t an issue and had it been on time I’d have probably gone back to the hotel for a bit; it being late saved the days bash! While pondering what to do in the 45 or so minutes I had I ended up changing a bit of money at a place on the main concourse area as I only had a small amount of Lei left. While checking what platform my train went from on the master departure boards in the main concourse area I was a little confused to not find it listed at all. A check of the electronic display screens revealed that IR1583 to Constanta was departing at 0945 and not 1015 as the timetable advertised; sure enough, if I’d looked a little further up on the master departures I’d have seen it. Now with a lot less time that I’d realised for my train I gathered some snacks together and went to board, the stock, a mere load 3, wasn’t back in until 5 minutes before departure but wasn’t wedged on departure. Had I been sat in the hotel, still thinking I had 30 minutes for the train at 0945, the day would have been down the pan and when I got to Ciulntia I really did think it had gone completely down the pan! The line to Ciulnita is fast and there’s no hanging about at all, unlike the Ploiesti line where slowing down for no reason seems to be rife. I was expecting more when I stepped off the train but Ciulnita is nothing more than a yard, which just happens to have a station. Shunting in the yard was a little Sulzer and waiting for connections from our train was R8593 Ciulnita – Calarasi Sud, retimed earlier than advertised in the timetable; which for some reason I didn’t note the engine of or the departure time! 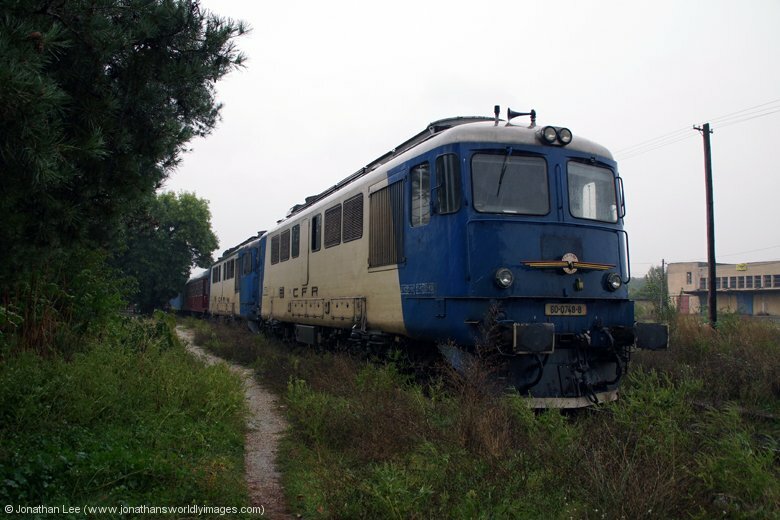 Once it had departed I went to figure out where the 1140 to Slobozia Veche was as it hadn’t arrived when it should have done; the timetable giving a clear reason why when I found neither R8583 Slobozia Veche – Ciulnita or R8586 1140 Ciulnita – Slobozia Veche on the list at all. 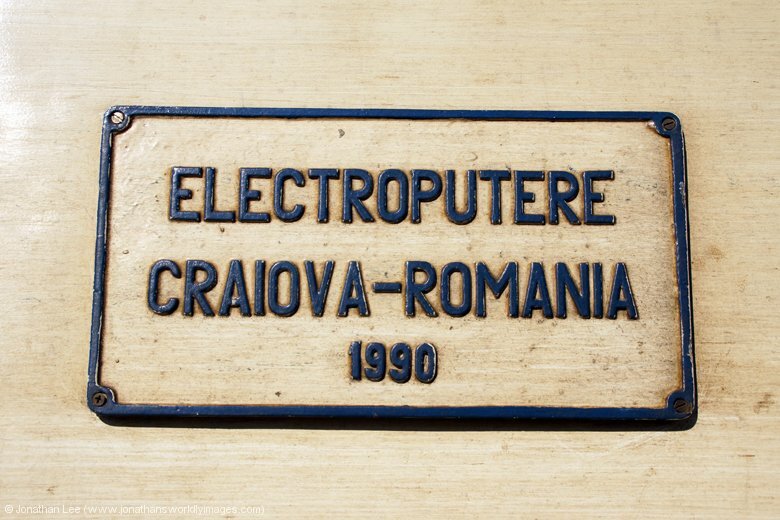 As it stood at that point, the next train to anywhere on the station departure list was IR1585 to Bucharest, which would be the same loco and stock returning from Constanta, that I’d just watched leave. At least there was a booking office at Ciulnita and inside were two women having their dinner. 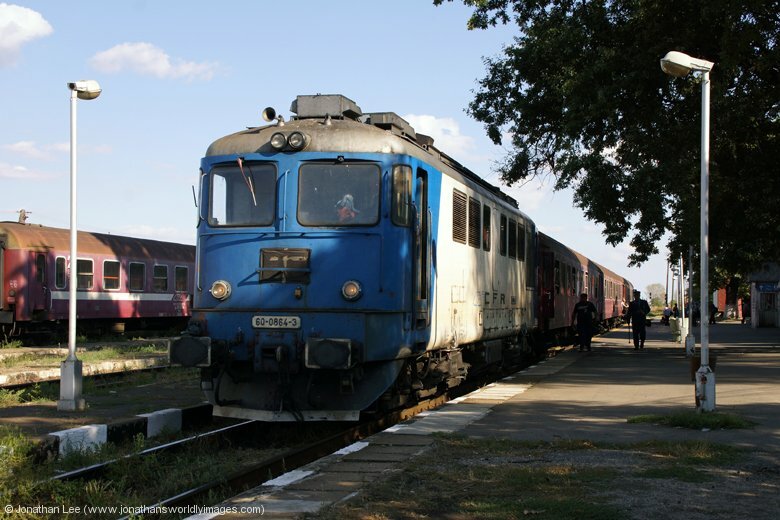 One came to the window when beckoned and showed me the screen of her computer to confirm the time of the next train to Slobozia Veche; it showed 15:43! She spoke no English at all but took me outside the station to the road that ran past it and after jabbering at the guys who were loitering around outside pointed to the road and jabbered to me; the only word I could understand was Autobus and I was guessing she’d been asking the guys if the bus had been seen heading past or not as she gave the impression it was due imminently. So there I was waiting on the roadway outside Ciulnita station when a bus did turn up, it was full and standing and I wasn’t the only one boarding outside the station. I told the driver my destination was “Gara Slobozia Veche” and he asked for 6 Lei and handed me a ticket. The bus then ran into town, for want of a better word, where it first emptied and then re-loaded. I thankfully managed a seat at that point, it wasn’t full to standing point and was actually quite pleasant and fully air conditioned. Having picked up in town we went back past the station and turned off the main road in the direction of Slobozia; the sign saying it was 17km. The total journey time, from me getting on the bus, took 45 minutes and I was dropped right outside Slobozia Veche station where all buses seem to terminate in Slobozia, at the bus station. Sulzer 89-0278 was sat in the platform with two coaches to form R8585 1429 to Ciulnita and shunted out of the station, to clear the platform for station rebuilding works to take place, was Sulzer 60-0864 with three coaches, labelled for Urziceni. 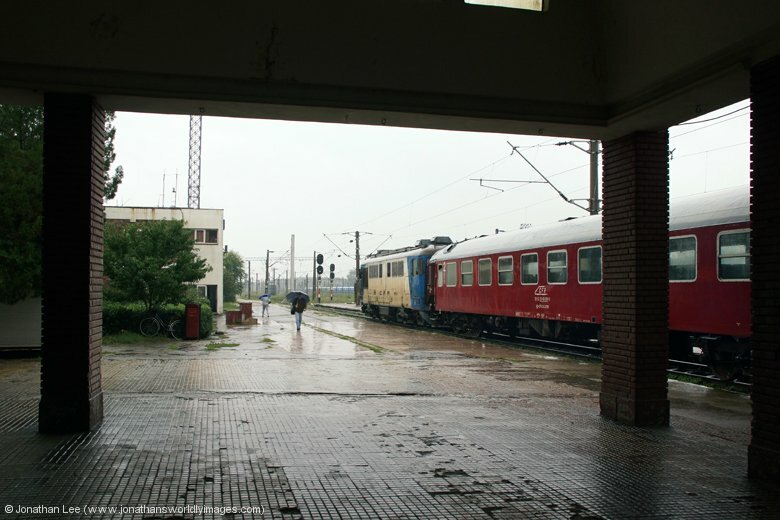 The station looked like it was having a complete overhaul and the main platform was hardly accessible at all; even Indian Railways would have made a better attempt to give people access to the station. As it was I had to use the muddy access road by the depot to get in/out and do my photting before utilising the time to do lunch. Ironically the bus had dropped me off at round about the same time the train would have so the 2 hour fester still stood. As college kids began boarding the train an hour before departure I followed suit, though the only door that was open at the rear of the train, and by the time the train was backed into the platform for others to board it was already full enough and by departure it was full and standing, as was 89-0278’s train to Ciulnita. Mine soon emptied out to a comfortable level and by Urziceni it was quite empty. 60-0864 wasn’t driven well at all and didn’t sound to be on full power so not the best of journeys thrash wise either. 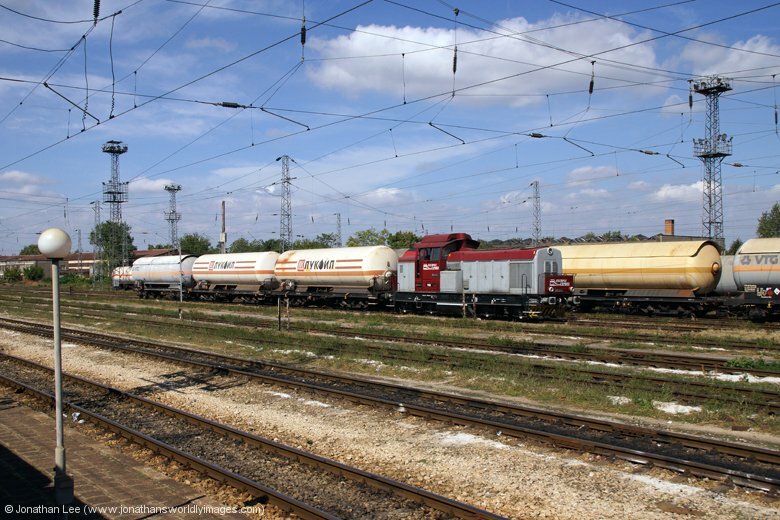 At Urziceni my suspicions were confirmed as 62-1142 was sat with the stock to form R7112 1635 Urziceni – Ploiesti Sud, the turn, including the Bucharest legs of R7040/R7033, clearly being a 2 day diagram from Ploiesti Sud to Bucharest and return. So I’d been done out of one Sulzer due to a train not running and I was about to have a dud one to Ploiesti thanks to diagram changes. 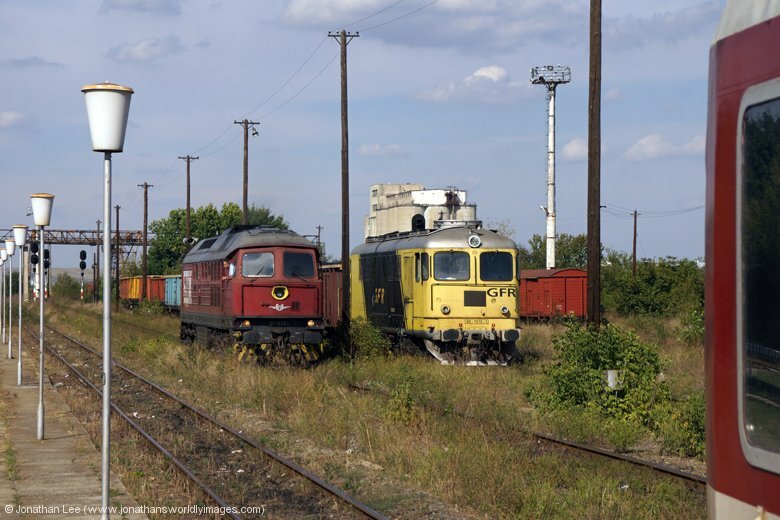 The worst of it was the driver off 60-0864 handed it over to someone else for the run round and return leg to Slobozia and he clambered into 62-1142 to take R7112 to Ploiesti Sud; so there’d be no chance of any thrash, even if the loco was actually capable. The shunter attaching 62-1142 had a rant at me for taking photos at Urziceni but the driver rectified the situation and basically told him to leave me be, from the gestures I could see, as I was only interested in photting the loco and not the shunter himself. 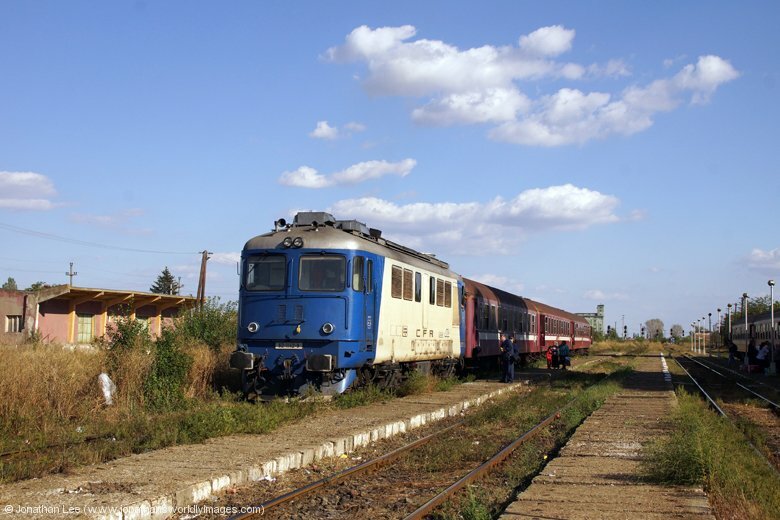 The run to Ploiesti Sud was a lot more comfortable than that coming across from Slobozia and the train wasn’t well used at all. The surprise of the day came when the driver beckoned me to the cab, after we’d crossed 82-0389 with R7109 1650 Ploiesti Sud – Urziceni. 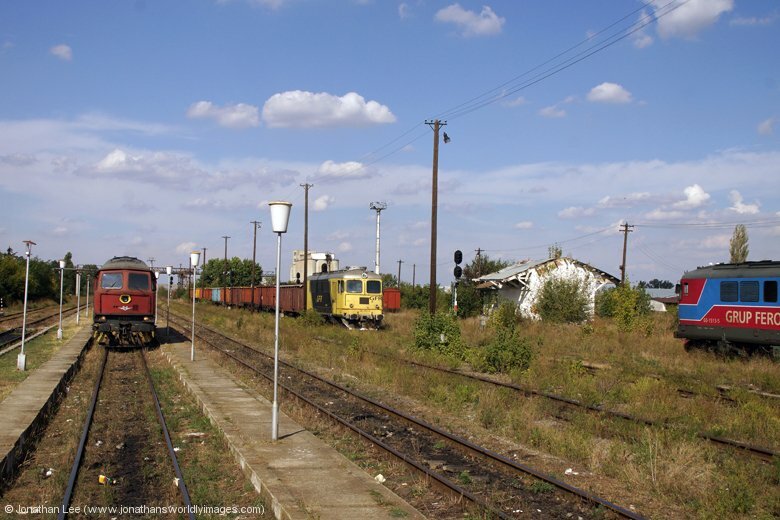 I was only in for a few stations and had to get back into the train at the last shack before Ploiesti Sud. The cabs are very spacious and strangely only have an opening door on one side pf the cab, on opposing sides at each end. The cab windows all had string to hold them shut and the driver complained to me about it whole I was with him. Had he been able to understand me I’d have complained there and then about his driving technique, the loco had 24 notches on the controller and he never went above 16! There’s a little electronic display by the controller that tells you what notch you’re in. The train was only load 3 though and accelerated to line speed quick enough so there wasn’t really a need to punish it, other than to try and appease me of course! Having seemingly had a conversation where neither of us spoke the opposing persons language at all, I got out of the cab knowing a lot more about the engines and had even been shown into the engine room while we stood waiting time at one place. 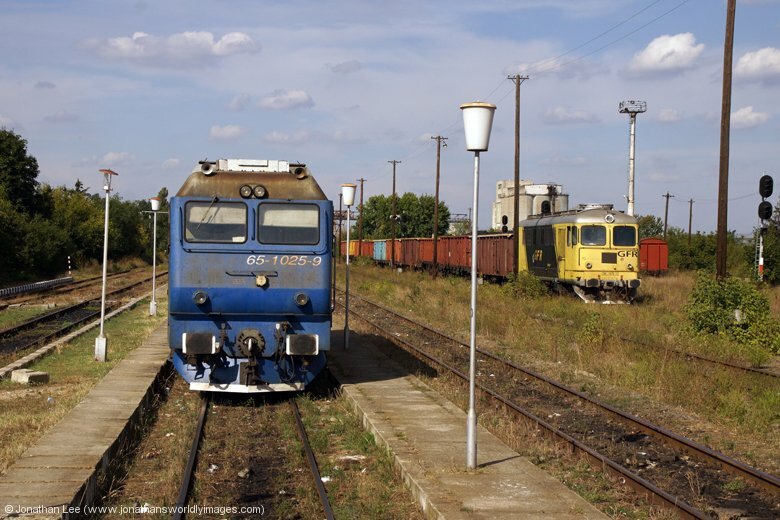 I was glad to be back in recognisable territory when we rolled into Ploiesti Sud and was soon away to Ploiesti Vest in a taxi to do IR1731 1640 Brasov – Galati back. There were plenty outside the station waiting and the 5 minute journey cost me 10 Lei, off the meter. 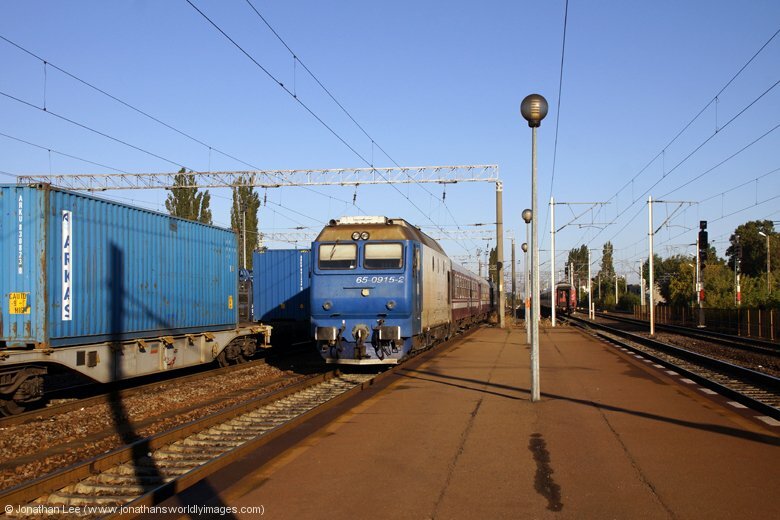 After 477773 delivered me back to Ploiesti Sud the move back to Bucharest was a carbon copy of the previous evening, IR1752 1230 Suceava – Bucharest Nord to Crivina, with 41-0588 for the third day in a row, for 41-0873 to Brazi on R3007 1808 Bucharest Basarab – Brasov for opposing working R3008 1645 Brasov – Bucharest Nord with the same engine as the previous night, 41-0402, to Buftea, across the platform and onto IR1622 0820 Timisoara – Bucharest Nord with 476692. 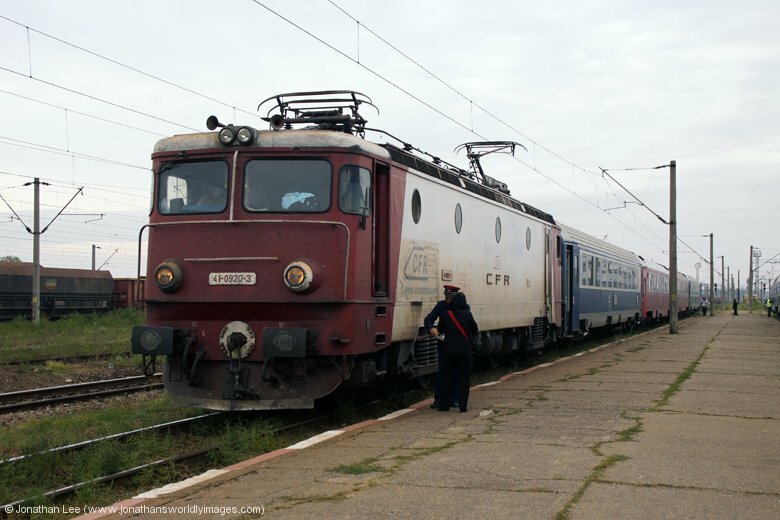 I knew the latter wasn’t going be a repeat of the previous night again as I’d seen 477784 heading to Constanta that morning. And that, as they say, was that; end of bash. I was flying out the following morning so had one last night at the Ibis and managed to offload all my remaining Lei in the restaurant before packing and retiring to be; not looking forward to the 0500 alarm call on bit! 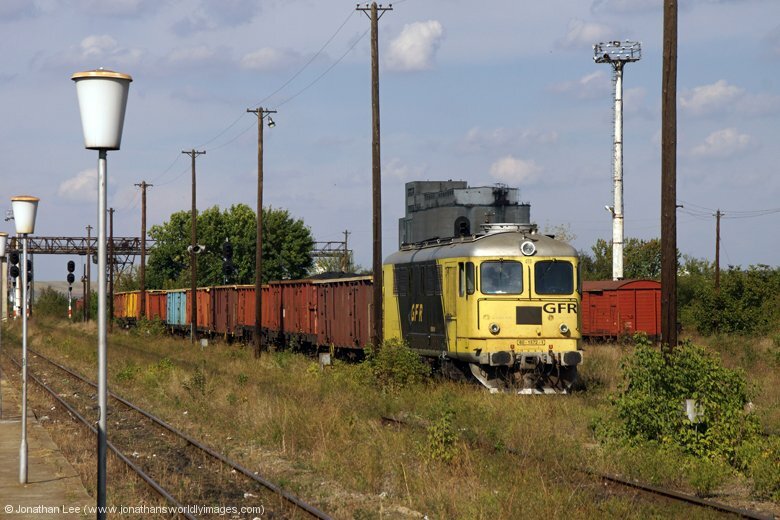 Note: 8583/8586 Slobozia Veche – Ciulnita & return do not run anymore. Simples, up, out, found 2 x Desiro with R7031 0550 Bucharest Nord – Urziceni and boarded for the Aeroport Halt. I had been planning to do the 0625 Targoviste behind it but it had been re-timed slightly later so I took the sensible option; and passed a GM with the stock in an adjacent platform as we departed. The Desiro was freezing and it was a cold morning. At least there were lights. The guard on board told me she’d let me know when we got to the Aeroport Halt and did so, along with another guy, the only other person to get off for the road connection. There’s a ramp down from the single platform to where the mini-bus was waiting. The driver inside wasn’t remotely interested in tickets and despite the journey showing 20 minutes in the CFR timetable it only took about 7 minutes. The bus dropped us at arrivals and then sat there to wait for its next booked departure to the station. My 3 week trip was now officially over, I had no valid tickets left and was Heathrow bound on the 0850 Bucharest – Heathrow British Airways flight. Bucharest airport was a breeze, the flight a joy, on board which we were served food but thanks to the flight being full the staff nuked the food and mine went back straight away as the scrambled eggs were grey! The proper cup of Yorkshire tea on board made up for the not so good food though and when I got back to Kings Cross with an hour and 10 minutes to spare for my booked 1305 to Doncaster I couldn’t help but ask the guard on the 1205 if he’d let me on; initially he wasn’t going to but once the staff badge was produced there wasn’t an issue and I was back at home in Doncaster before I would have been at Peterborough on my booked train.